There is a group that I belong to on Facebook whose aim is to bridge the gap between the glbt and conservative Christian communities. There is a fellow in the group who repeatedly posts things from his Biblical perspective that homosexuality is a sin. He is strident and does not appear to absorb or even ponder what other members of the group have to say. Most, but not all, of the members are people who grew up in the church and struggled for years before they reached a point where they started to accept themselves as is. We share our stories and connect. But this guy, he just kind of comes in, lobs a grenade and runs away, never responding to other members’ constructive comments about whatever he has posted. After a couple of weeks pass, he repeats his cycle. I could wonder why this man, a young, Midwestern husband and father, is so fixated on that Biblical issue, but I’ll never really know his story. And that’s fine. I’ve never met him. I personally don’t have any interaction with him. I don’t respond to his posts. But he does remind me of someone I know. When I lived in New York, I was a member of an amazing church. I moved to New York knowing no one, they helped establish me in the city, they were my first friends. When I came out to the pastor and his wife nearly a year after I’d moved to New York, their first words were affirmation that I would always be a part of the congregation. By that point, their words and deeds had led me to suspect as much, which, it goes without saying, was a tremendous relief in a tumultuous time in my life. And I guess the reason I knew that I would still be loved, accepted at this church was the way the congregation loved and accepted a man named John. There are things I’ve probably forgotten about John and perhaps things I’ve remembered not quite precisely. John was gay, probably in his fifties. He never in my presence talked about his sexuality, but I’d been told he had a long time lover that had passed away. He was a greeter, always one of the first people to welcome you and give you a bulletin of the church program. He always wore a suit and tie, always had a kind smile. John and I spoke every Sunday, it was a small congregation. I have no recollection of any specific thing we discussed, but I thought he was a nice guy. I liked him. I also, probably, foolishly, pitied him a little. One Sunday, months before I came out of the closet, but certainly while I was wrestling with my sexuality and my identity, I was asked to preach a sermon. It just happened to be gay pride weekend, the day of the parade. And while my sermon was not completely about my perceived interpretation of homosexuality being Biblically immoral, I remember I touched on how the gay people celebrating on Christopher Street did not know the “truth.” While I was writing the sermon, I thought about John and how my words might hurt his feelings, but I reasoned, John needs to know what the Bible says. As if in his 50-some years no one had ever told him. Just thinking about that day, I cringe. I don’t remember John ever treating me any differently after that sermon. I also don’t remember John treating me any differently after I came out to the church less than a year later. When I moved to Los Angeles, I lost track of most of the people in that church. I find that sad, too, because, they were very, very good to me. I do not know whatever happened to John. It seems possible I heard he’d passed away, or maybe he moved to Florida. There is one thing that gives me comfort when I think of my fervent sermon about God’s truth that long ago gay pride weekend and that is John knew what was going on the whole time. I was a fresh-faced, corn-fed, passionate Midwestern boy who had moved to New York with a dream, or two. And he knew before I knew, I was on the road to becoming the person I did become. He’d seen it all. So that’s why I have a little patience with the guy in my Facebook group who lobs dagger after dagger. I think he’s working through his own issues, and let’s be clear, his issues may not even be my issues, but there is something going on that’s shaking his faith. And my wish for him is peace in his spiritual and emotional life. Whoever he is, I want him to accept it. I don’t doubt that John wanted the same for me. There is an irony that at 46, living in Los Angeles, the stories I most gravitate to are stories about gay culture in New York in the 60s, 70s, and 80s. If I’d known John a little better, I might have had a mentor, my own historian. I can hope that John knew the influence he had on me, but I doubt he did. Still, I’ll always remember him fondly, a sharp dressed gentleman of a certain age, greeting not just me, but everyone, into the flock, with open arms and a welcoming smile. It was one of those jaw dropping, did I really just see that moments. I was on Facebook, per usual, scrolling through posts and I stumbled upon a picture of someone’s kids in long grey beards and bandanas. That really can’t be what I think it is. And I read the attached caption. This person’s children had been at Duck Dynasty Vacation Bible School all week. I had no idea such a thing even existed. I did a little research when I saw it, a few weeks ago. Apparently, there is a Duck Dynasty curriculum for everything: Vacation Bible School, teen programs, adult programs. That family really knows how to make money. Wow! If you go to a Christian publishing website, you’ll see how many Duck Dynasty created items are out there. I guess I didn’t quite realize the depth of their influence. Now, I really try to keep my blog as clean as possible. I seldom swear here, I don’t talk about sexual acts, of any kind. That quote above, you most likely know, is from a GQ interview Duck Dynasty patriarch Phil Robertson gave a few months ago. It ignited a controversy, which I believe he, and the family, too, knew would erupt in the way that it did. My Facebook newsfeed was full for days, weeks, even still, with folks weighing in on the interview and the subsequent interviews. Most of my friends, obviously, expressed disdain, discouragement, disappointment. And also, a handful of people I know expressed pride. “I’m with Phil!” was posted by a guy who I only remember as being a jerk in high school and the last time I saw him, sometime not long after college, made fun of me to my face about being gay. This family, they have struck a chord with the American public. Whether or not I like them or watch them is irrelevant. What is relevant is that they are influencing people and probably not in the best ways. The whole fallout over this initial interview was to position themselves as Christian martyrs, suffering for their faith. In all of the interviews, snippets of episodes, merchandising, I have seen nothing that deters me from my initial reaction which is Money is their God. There is nothing they love more than making money. I don’t think living to make money is such a bad thing, sometimes I wish I was a little more money motivated. If I was, I would probably have more of it. As a whole, I do not think they are good role models, for anyone, but it especially scares me that what they are selling is being sold to grade schoolers. 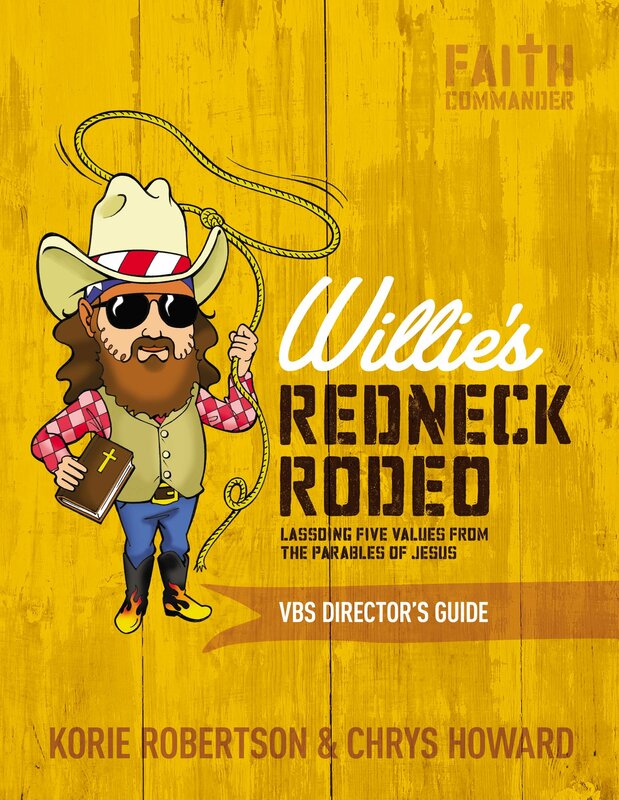 This particular VBS, Willie’s Redneck Rodeo is nothing more than a rehash of the Parables of the Gospel, the implication being that the Bible itself is not interesting enough to be taught as is, so one must put a beard and bandana on it. They proclaim that their message is not anti-gay, but it is. I am not alone in that observation. I don’t believe in talking to children about adult topics, that they should be shielded from certain life realities for as long as possible. There is just something about choosing these people who are so famous for their polarizing lifestyle that doesn’t sit well with me. I am sure not everyone who reads this will agree with me. I wasn’t going to write about this, I generally tend to avoid political stuff because I’m no expert about anything, except maybe The Brady Bunch, The Facts of Life, and shamefully, Big Brother. But, hey, it’s been on my mind, on my heart, and I wanted to express it. Ultimately, I guess that family reunion this weekend is still on my mind. Maybe it’s because I was raised in the church that I was a little surprised by the way my family wholeheartedly embraced Eric with such open arms, from my 7 year old cousin Angelica to a distant 80-something cousin who when Eric and I were leaving whispered in my ear, “I like your friend.” We just want to be part of the family. Before I move too far away my time in Pueblo, I’d like to say a little something about how much I enjoyed the city itself. It always warms my heart to see any city or town, small or large, take an interest in its history and preservation. Sunday night, my Dad drove my Mom, Eric and me around the town so we could hop out and take pictures of old hotels and motels, churches, neon signs, the county courthouse. (Check out my Instagram pictures here.) It was a great way to end the trip and it made me want to find out more about Pueblo’s history. As I once did with my hometown of Independence, Kansas, I compiled an album of vintage Pueblo postcards that I found on the internet. 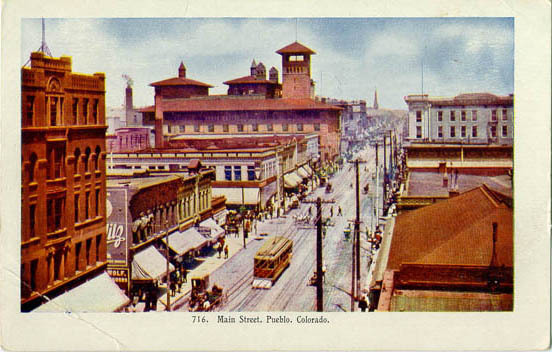 Many of the structures in these century old postcards look pretty much the same which is a testament to, among other things, the work of the Pueblo Historic Preservation Commission. So, if you love Pueblo, or architecture or history or just old postcards, please check out these great pictures. I spent the weekend in Pueblo, Colorado at a family reunion. It was the first time Eric met many of my relatives and I was touched again and again by the way everyone welcomed him into the family. I had been a little nervous about sharing that part of who I am with relatives that I only see a handful of times in a decade, but it turned out to be great. Still, if there was one moment that defined the reunion for me, it was Saturday night after the meal when they moved the tables to turn the church fellowship hall into a dance floor. I posted a picture on Instagram and Facebook and it’s probably the most popular picture I’ve ever posted. I posted this picture of my parents dancing to the Frank Sinatra cover of The Way You Look Tonight. I’m no Diane Arbus, surely, but I do think I captured a lovely moment between the two of them. My folks must have felt like the Brad and Angelina of the reunion because joining me in the quest to get a great picture of them were about 10 or 15 of my cousins. Mom and Dad would look at the camera, smile and then keep dancing. I’ve always known and been comforted by how much my cousins love and look after my parents. You don’t live into your 70’s without having some lows and highs in your journey. You can expect heartbreak and belly laughs, illness and healing, embarrassments and proud moments to weave together in the fabric that is your life. My parents, of course, are no exception. As they danced together, I thought of the highs and lows, their story of love. If you read my blog regularly, you might know about my Father’s three battles with cancer, the toll it took on his body and, at times, his spirit. And you might know that he couldn’t have survived and thrived without the support of my Mother who doesn’t always give herself credit for how strong she is. 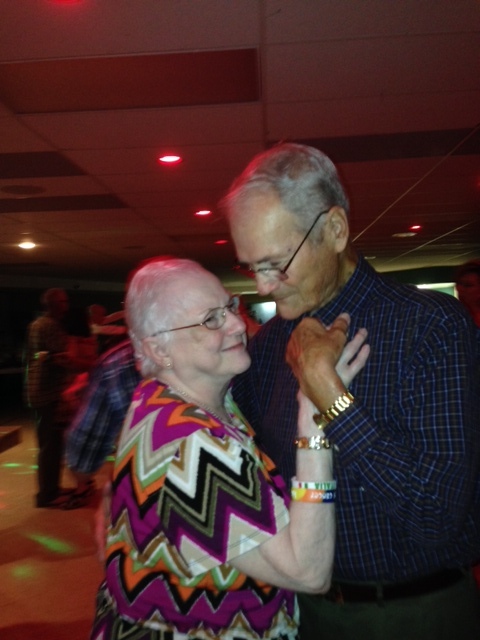 But there they were, on the dance floor, hand in hand, cheek to cheek as Frank sang for them. That night I thought about all the stories of the reunion. I thought about the festive Christmas Eve’s with St. Joseph’s spaghetti and fried bread at my Uncle Rocky and Aunt Barbara’s house. I thought how this was the first reunion without my Uncle Sam, who died a few months ago; his absence was felt. I missed my Aunt Cathy who wasn’t able to be there this year, but asked her nieces and nephews to post many pictures on Facebook for her. (We were happy to oblige.) 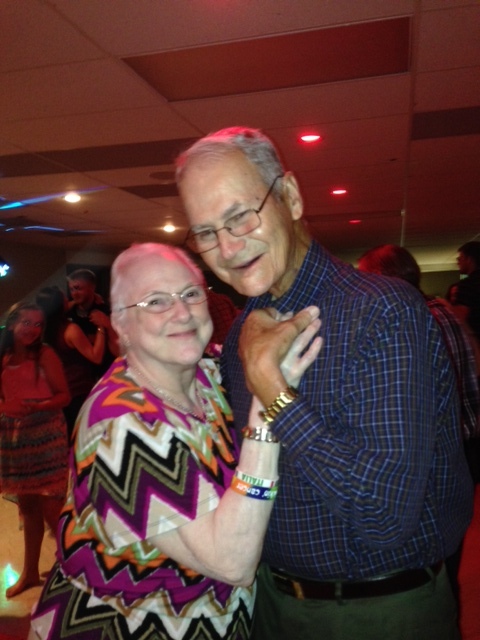 And I was moved to see my Uncle Mike and Aunt Marlene, who’ve weathered much themselves, also on that dance floor. Some cousins danced, some cousins sat and talked. I don’t think I was the only one a little awash in complex, vivid memories. Reunions are bittersweet occasions. Anyway, the reunion is over. 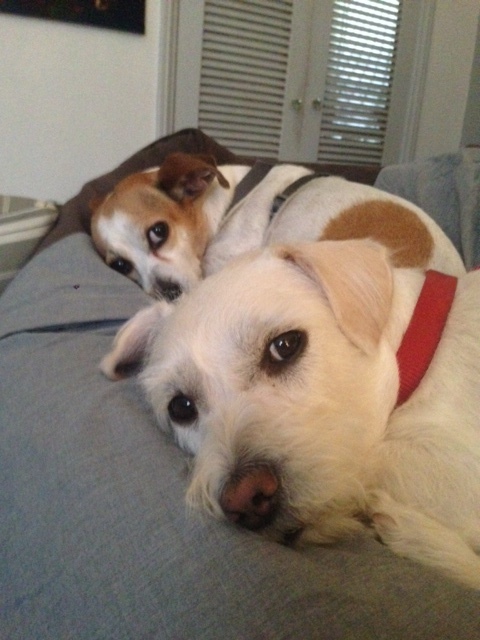 I’m back at home, drinking my morning coffee, two dogs begging to be taken for their first walk of the day. My heart is still in Pueblo, but it’s also right here in Los Angeles, too. For as long as I live, not just when I’m awfully low or when the world is cold, when I hear this song, a song I never thought too much about previously, I’ll think of this reunion and of my parents and, well, fondly remember the way they looked that night. For the last few months, my check engine light has been coming on in my car. It would last a few days or weeks and then disappear only to reappear days or weeks later. It’s no surprise how long I can put off something I don’t want to do. If you don’t believe me, ask my dentist. Anyway, yesterday, I mustered the courage to address the check engine light. I called my VW dealer in downtown LA and made an appointment. At 9:30, I dropped off my car. The shuttle was leaving as I bit into my first bite of the free chocolate cake donut that I’d been fantasizing about on my drive to the dealership, so I ran to the shuttle and asked for a ride into the heart of downtown. The guy in the front seat was being dropped off at Main and Temple and I said that was fine for me, too. When the driver dropped us off at Main and Temple, I said my thanks and looked around. Okay, what will my downtown adventure be today, I thought. 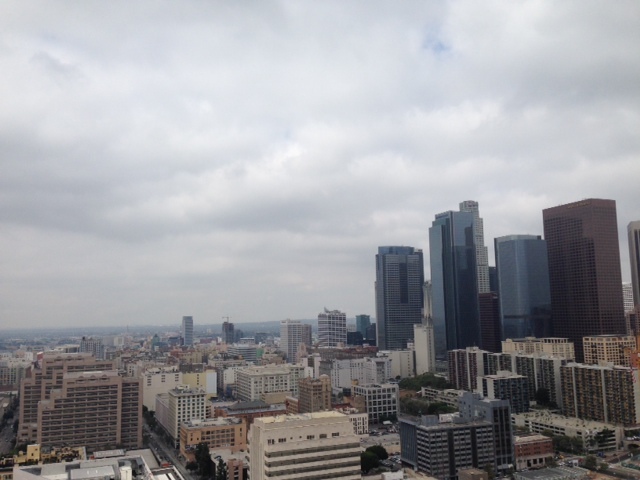 I pondered walking to Grand Park and then I looked up at City Hall and remembered that the Observation Deck on the 27th floor is open to the public Monday through Friday, 9am-5pm. So, I walked into City Hall, was checked through security and asked the police officer at information how to get to the observation deck. After taking an elevator to the 22nd floor and getting on another elevator to the 26th floor and walking up a flight of stairs, I was on the open balcony of the 27th floor of City Hall and I was completely by myself and I felt like the entire freaking city was mine. I walked around and took pictures. The entire time I was up there, I shared this amazing view, these amazing views, with only a handful of people. It was one of those “I am such a lucky guy” moments. Anyway, while I was on the deck, Eric told me I had to check out the rotunda in City Hall, so I went back to my friend at the information desk, who, by the way, reminded me in all the best ways of Edie Falco. I asked Edie where the rotunda was. “Take the elevator to the 3rd floor, you can’t miss it.” And I took more pictures walking around the 3rd floor. Business types floated past me as I shuttered away. They think I am a tourist, I thought. And you know, I am sort of a tourist, but Los Angeles is my home too. At 46, I’ve lived here longer than I’ve ever lived anywhere else. I love LA. Also, I hate LA. But LA is part of who I am and I am part of who she is. And experiencing City Hall in such an intimate way, made me proud. But wait, there’s more. I popped into The Last Bookstore (453 S. Spring), one of my favorite used book sellers. The first time I went there, no one had told me about the labyrinth upstairs where all books are $1. I don’t want you to make the same mistake. I spent an hour there picking through shelves and boxes. I purchased four books and as I was leaving, I thought, wait, isn’t the Bradbury Building near here. Shameful side note: I’ve lived here 20 years and had never been inside the famed Bradbury Building, famous among other things for being a noted filming location (Blade Runner, The Artist, Chinatown, Disclosure). So, I walked over to 304 S. Broadway and made my own history by going in and taking some pictures. And by the way, my pictures do not do it justice. As I was leaving, VW called to tell me my car was ready. (I never did quite understand why the engine light came on in the first place.) They asked if I wanted a shuttle and I paused and decided I would walk back. I walked down Broadway to Fifth, then walked through my favorite downtown hotel, the Millennium Biltmore. Then I walked to Bottega Louie and pondered buying a sandwich (I passed) then walked over to Figueroa and walked into the trippy Hotel Figueroa, then LA Live, then all the way down Figueroa to Washington, turned left and my tired legs were back at VW. When they brought me my car, it had been washed and vacuumed and then I went for my morning swim that had been postponed into an afternoon swim. And while I was swimming, I thought about how great my day had been and that I wanted to go home to blog about it. But I also thought, while I was swimming that maybe it’s not a good idea to proclaim, “This is how awesome my day has been.” That maybe, that’s an invitation to the universe to send something horrible your way. And while I drove home, decided against writing a blog about how awesome my day was, (don’t tempt fate) I wondered why I was so neurotic, why couldn’t I just enjoy my day? I did not blog later that day, instead Eric and I went back downtown to visit his friend Val and the three of us dined al fresco at a new restaurant (Zinc Cafe & Market, at 580 Mateo St.) and had a relaxing vegetarian meal. As the sunset on a perfect Los Angeles in July evening, we ate meatless tostadas, mushroom pizza and even ordered dessert. When our brownie a la mode came out with orange zest on it, I thought, I do NOT like fruit and chocolate. But I tasted it and it was really, really delicious. Maybe even better because of the orange zest. Who knows? Anyway, last night, as I sat on the couch reading one of my new $1 books, I thought, THIS was a good day, maybe even a perfect day. And yes, perhaps I should have just kept it to myself, but I have decided to share it with you. Sometimes, you have to tempt fate. I can’t imagine I’m the only one who grew up loving “Weird Al” Yankovic video spoofs. What’s your favorite? My Bologna? I Love Rocky Road? Eat It? He has a new song and video, Tacky, which is a spoof of Pharrell Williams’ Happy. Al’s version is as fun and danceable is the original. I am sharing the video here. It’s a delight to watch Al and co-stars Aisha Tyler, Margaret Cho, Eric Stonestreet, Kristen Schaal, and Jack Black dance and lip sync in garish ensembles, but I have to be honest, the filming location steals the video. I don’t want to give too much a way, I want you to watch the video. Suffice to say, if you love LA or you love downtown or you just love historical preservation, you’ll love this. 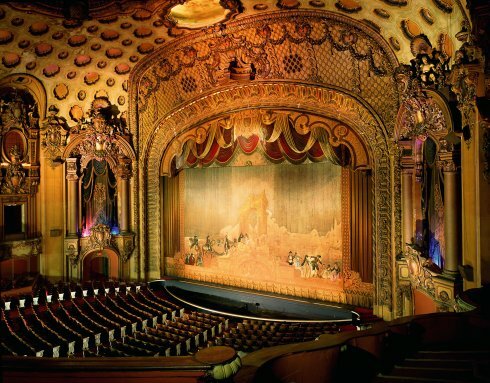 The person who came up with the idea of filming the video at the Palace Theater in downtown Los Angeles was a genius. And I appreciate the irony that a song about lacking class and doing the inappropriate thing is ultimately a thoughtful and gracious love letter to my city and those beautiful old theaters of the other Broadway. Last night, my friend Janet gave me a copy of playwright Arthur Miller’s memoir, Timebends: A Life. He wrote it in 1987. As Janet pointed out, one of the big stories of his life is not even addressed. In the 599 pages of the book, Miller never brought himself to write about his son born in 1966 and institutionalized soon after. The boy’s name is Daniel and he was born with Down Syndrome. If you read the index of this memoir, you will find pages about his other children, Robert, Jane and Rebecca, but nothing about his youngest. 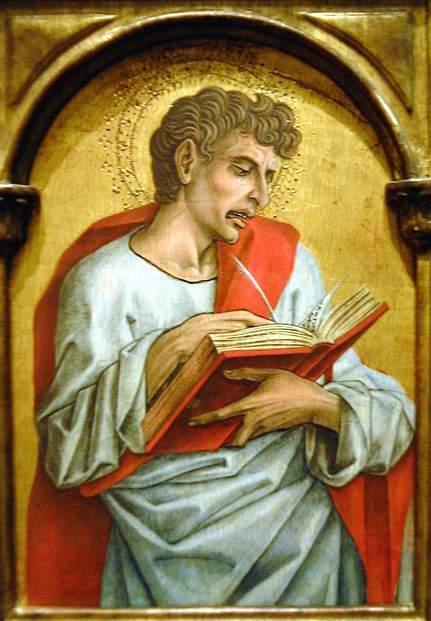 During his lifetime, he never spoke or wrote publicly about Daniel. You might have heard about this open secret, there was a polarizing Vanity Fair article written about it in 2007, shortly after Miller passed away. I thought about this story quite a bit last night and this morning too. Apparently, Miller’s rationale about institutionalizing Daniel in 1966 was that that’s what people did at the time and he feared that keeping the boy at home would be a disadvantage for his next to youngest, Rebecca who was born in 1962. (You might know this, but Rebecca Miller grew up to become a writer and filmmaker herself and is married to Daniel Day-Louis.) While Miller’s wife Inge visited Daniel regularly until her death in 2002, the playwright very seldom visited. I am a storyteller myself, certainly not one as gifted as Arthur Miller, but a storyteller nonetheless. My friend Janet who gave me the book is also a storyteller. We both participated in a show last night with some of our best friends, Linda, Sarah, Michael and we also heard stories from two people I’d never met before. And what impressed me most, touched me most, was the honesty I witnessed. And with every story, without exception, there was this moment, when I could feel the person pause and wonder, do I really want to share this much of my story? A young man going into the military to ignore his sexuality? A cancer survivor yearning for the glow of her youth? A woman betrayed by her two best friends? I don’t think it was easy for them to reveal so much, but they did. And their candor, their vulnerability is what I’ve also thought about, carried with me all day today. It’s been said that Miller’s finest work was written before 1966. People have guessed that the burden affected his writing, though he continued to be prolific, in the years that followed. I am interested in his story, what led him to create men and women like Willy and Biff and Eddie and Beatrice and Catherine. He wrote famously about his marriage to Marilyn Monroe in After the Fall. Maybe there was a part of him that wanted to write about Daniel, too. I can wonder about his path of logic concerning the matter, though I’ll never know. But here’s the deal. There is the story and then the story of the story. His presumably forthright memoir that still sits on my desk, that I still look forward to reading, is not necessarily diminished by the glaring omission, but it’s indeed colored. We are all storytellers. You might demure that you aren’t but, be honest, you know you are. You tell your story on Facebook and Instagram, at cocktail parties and board meetings and fellowship groups. I know that I am not the only one struggling with how much of my story, my heart, my frailties, my complexities, I’m willing to share. There are things that I think that no one will ever know, that most of you probably already know. And that’s the way it is. So, I guess, my advice, and it’s especially for me, is share your story as honestly as possible. It’s been my experience that the truth is what we respond to most.